Christmas has come early, and it’s available all year round with this slot on Wizard Slots. Feast your eyes on beautifully decorated trees, snowmen and Rudolph the red nosed reindeer who is happy to give you your Christmas jackpot bonus. Try playing these casino slots today! Eyecon was founded in 1997 with the intention of creating the best gaming solutions on the market. After initially producing desktop computer games they eventually moved into the online slot gaming market going on to produce some of the most popular games in existence. See Fluffy Favourites and Gamma Girl to name just a couple here on wizardslots site. Looking for best new video slots with Christmas as its theme? We offer you Xmas Cash! While playing this slot, you will be submerged deep into a powerful green background and a lovely decorated Christmas tree along with some candid multi-coloured lighting. Symbols that are featured on Xmas Cash ranges from a Bell, a Christmas Tree, a Snowflake, a Cake, a Stocking, a Snowman, and good old Rudolph the Red-Nosed Reindeer himself. 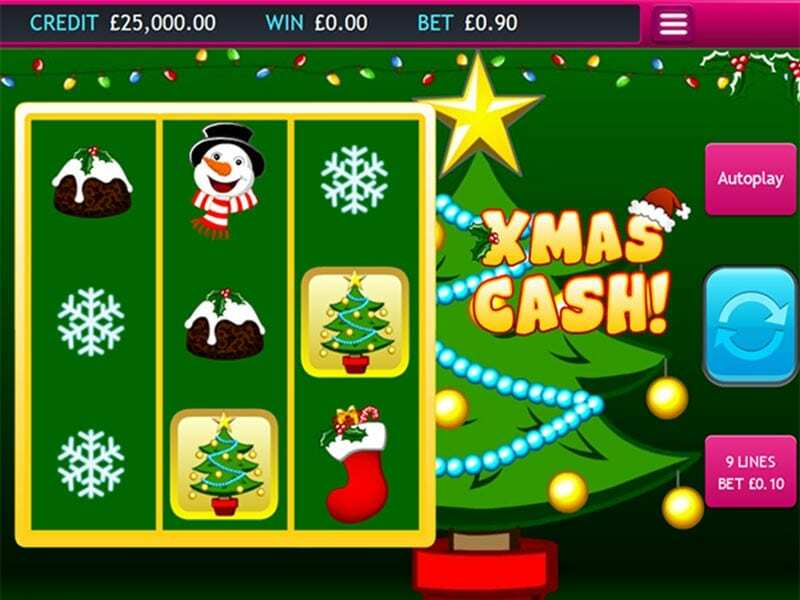 Xmas Cash Slots has been created for its simplicity, for players who prefer an easier slot game with the standard pay lines and reels and who are looking for a bit Christmas cheer. 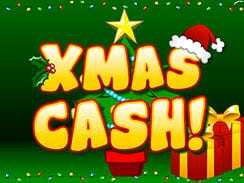 Xmas cash is a wonderful 3 reel slot game to get involved in this yuletide. You may modify the number of lines and bet amount per spin by clicking on the Line and Bet Button. You can select between 1 to 9 pay lines by dragging the slider up or down to increase or decrease the number of pay lines, change your bet amount which ranges from £0.01, £0.02, £0.05, £0.08, £0.10, £0.15, £0.20, £0.30, £0.50, £0.75, £1, £2, £3 to £5 by dragging the slider up or down to increase or decrease your stake amount. Xmas Cash is responsive across devices of all natures ranging from desktops to tablets, to mobiles, meaning you can play on the go anywhere, anytime. Xmas cash is stacked with special features, ranging from Free Games and Prize Pick Features. The Xmas Cash logo substitutes for all symbols except the scattered Christmas tree and Bell symbols. The Xmas Cash symbol is also the highest paying symbol, where 3 such symbols appearing in a winning pay line will award you 1,000 coins. Eight Free Games are triggered when three or more scattered Bell symbols appear anywhere on the reels during which prizes for line wins and scatter wins are tripled. Free Games are played using the same pay lines and wager as the triggering game and it can be retriggered multiple times. The Prize Pick Feature is triggered when three or more scattered Christmas tree symbols appear anywhere on the reels. During this feature, you will be awarded three picks which can award you a massive prize. There’s a Gamble Bonus mode and this feature pays double or nothing on the last win. To win in the Gamble Bonus mode, you need to correctly select which one of two available choices will be revealed. The gameplay continues until you select the ‘take win’ option and scarper with your money and newly accumulated wealth. If you’re looking to find that warm and fuzzy Christmas feeling all year round then you certainly shouldn’t pass up the opportunity to play Xmas Cash. This slot game looks brilliant and also has a range of detailed features that can be played through for hours. Wizard Slots rates this game highly and it’s certainly not a game prescribed only for the winter months.